Traditionally marine energy device development has been tested at very small scales (typically of the order of 1/67th to 1/100th scale) before jumping to a much larger scale more appropriate to sheltered real-sea conditions (for example 1/7th scale). The cost of this larger scale work, in manufacturing, offshore deployment and carrying out testing, is considerably larger and there is an inherent risk in scaling up too quickly. This is all the more costly when things don’t quite go right at the larger scale. At 1/20th scale the FloWave Ocean Energy Research Facility plugs this gap and enables engineers to de-risk their designs and so deploy ‘right first time’ in the real marine environment. A key requirement in realising the ambitious targets set for wave and tidal current generation in UK and European waters by the end of 2020 is the ability to de-risk the development and deployment of marine energy technologies. This means testing at meaningful scale, in realistic and repeatable sea conditions, in a controlled environment – but on dry land! 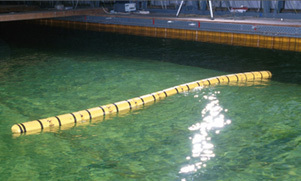 The FloWave Ocean Energy Research Facility provides such a solution, able to test between 1/10th and 1/40th scale, with combined current and wave environments representative of any of those experienced in UK, European and International waters, in a robust, repeatable and reliable manner. Large scale model testing forms the key second stage in development. The FloWave facility will for the first time allow the impact of current on wave devices to be tested in a controlled environment, prior to field testing and commercial deployment.